Our LED Light Box uses very high intensity white LED's that produce an even, shadow free illumination across the whole of the light box face without hot spots or shadows. The supreme brightness ensure retail posters, transparencies and backlit prints really stand out. The functional snap frame fronted light boxes with their energy saving illumination make these ultra slim light boxes the perfect display light box. 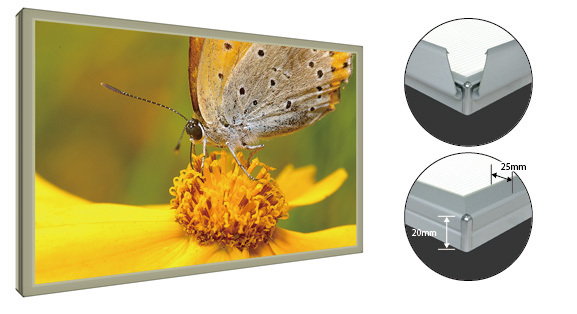 The aluminium section, at only 20mm (0.8") depth with a 25mm (0.98") wide snap frame, is an ultra slim and attractive light box with neat rounded corner pieces. Simply snap open the front frame change the poster and snap shut - it's simple and convenient. Standard Size (inches) - Available Any Custom Size up to 98" X 59"
There are numerous sign sources in Sign industry. And LED light box has been known as alternative for fluorescent bulb for a while because of its environmentaly pollution[contamination] free characteristic combined with low energy consumption. These are few of many virtues of LED light box and these has been appealed to a lot of sign dealers that has became one of the main sign sources in a lot of shopping malls, commercial complexes, airports, bus stops and department stores as light display usage. We, FEELIS has been manufacturing cutting edge technology of all LED strip and LED light box since 2005 and we've been hardening our reputation on the ground all over the world. LED light box is for special advertisement combined by brilliant idea and state of the art manufacturing techniques in the field of lightening advertisement. Our LED light box is unique because of their brilliant light display. LED light box has uniform light distribution across the entire surface with extremely low energy consumption (A4 LED light box consumes only 3 watts). The LED light box has average lifespan of 50,000 hours, which is more than 10 years when 12 hours per day. this means you won't have to spend a dime on your maintenance. These are available in any size from A4 size to 2500mm X 1500mm (98" X 59") and can work without any discoloration of the LED light box, caused by heat dissipation. Offering with 20mm's depth of LED light box provides the most even brightness all over the surface. Our LED light box will present the finest quality of all and stand out among all the graphic images in the complex. Our unique pattern of the LED light box will guide light from LED's into the middle of the section and our hit sink design will emit all the hit from the LED's so you won't feel any hit or dark spots unlike traditional bulbs. This will also present the ultimate happiness to your potential customers and current clients. Our solid spring hidden frame design solved out all the squeaky sound after numerous images changing of the LED light box with elegant rounded corner ensures no one gets hurt from sharp edges. You might feel the initial expenses would be higher than traditional florescent box but as time gets by with electricity bills, you will soon enough realize you will regain your return of investment. FEELIS's LED light box illuminates exceptionally bright light due to high luminous intensity LED strip as well-known as a leading light source for next generation. We have been successfully developed SMD top view type LED module inside of the LED light box with variety of colors from 2,700K to 9,000K at every 500 Kelvin which is proven to be the best reliability together with V-cut pattern that is also proven to have the best adaptability for the characteristics of LED's. And more surprisingly, FEELIS's solution would be the LED color's sustainability among so many colors including RGB. Therefore you won't ever have to worry of color changing for your future reference. We can always provide LED light box's technical specifications and regarding data that measures our high& even brightness created by putting only LED strip on the edge. It will reduce energy consumption tremendously and save more as time goes by moreover LED last more than 10 years ( light on 12 hours a day). Also in addition, if large sizes of LED light box were made in with florescent bulbs, people should be hired to replace the bulb often which LED doesn't need to. Minor options as frame color of the LED light box, direction of installations are always welcome. For more information, please refer to our online catalog.